Australia is an outstanding natural laboratory to study the influence of dynamic topography on landscape evolution, having been largely unaffected by tectonic deformation since the Jurassic. Recent studies of the past eastern Australian landscape from present-day longitudinal river profiles and from mantle flow models suggest that the interaction of plate motion with mantle convection accounts for the two phases of large-scale uplift of the region since 120 Ma. In a paper in Geochemistry, Geophysics, Geosystems, EarthByters Tristan Salles, Nicolas Flament and Dietmar Müller coupled the dynamic topography predicted by a mantle flow model to the surface process code Badlands, developed in the Basin Genesis Hub, to quantify the feedbacks between mantle flow, landscape dynamics and sediment transport. The mantle flow model predicts that Australia was dynamically tilted down to the east 150 Myr ago due to long- lived subduction along the eastern border of the continent. Subduction rolled back 100 Myr ago and the eastward migration of eastern Australia over sinking ancient Gondwanaland slabs caused it to rebound from being drawn down. Following a period of absolute plate motion stagnation, renewed uplift of the eastern highlands occurred during the Cenozoic, as the Australian plate migrated over the Pacific Superswell. Badlands models were driven by the predicted evolution of dynamic topography, varying rainfall regime, erodibility, long-term sea level variations, dynamic topography magnitude and elastic thickness across a series of experiments. The Badlands models quantify the time dependence of erosion and deposition, as well as the evolution of catchment dynamics, drainage capture and drainage network reorganisation. 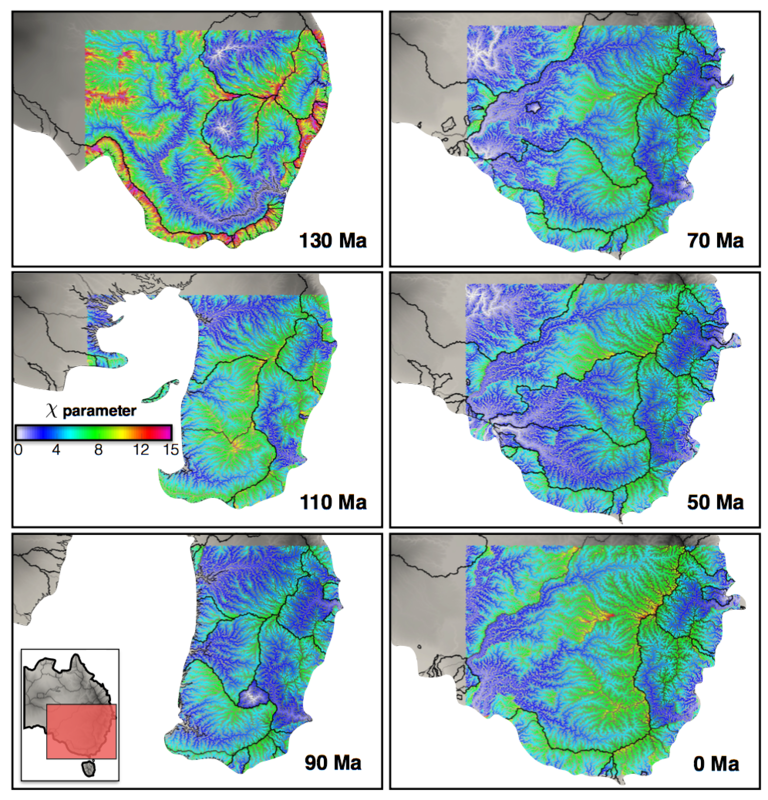 The predicted temporal and spatial changes in longitudinal river profiles as well as erosion and deposition maps show that the motion of the Australian plate over the convecting mantle resulted in significant reorganization of the eastern Australian drainage, continental-scale erosion and sedimentation. The model predicts that the Murray River drained eastward between 150 and ∼120 Ma, and switched to westward draining due to the tilting of the Australian plate from ∼120 Ma. The predicted denudation of the eastern highlands is compatible with thermochronology data and sedimentation rates along the southern Australian margin are consistent with observed sediment thicknesses in associated basins. These results reflect the fundamental links between continental-scale dynamic uplift, and continental-scale drainage evolution and sediment deposition in basins.